Miami Trace’s Drew Batson attempts to make a move against Hillsboro’s Ethan Snapp on Thursday at Hillsboro High School where the Indians battled the Panthers in an FAC match. HILLSBORO – Frontier Athletic Conference varsity boys soccer teams Hillsboro and Miami Trace squared off at Hillsboro High School as each team fought to earn the win both would fall short as the match ended in a 2-2 draw. 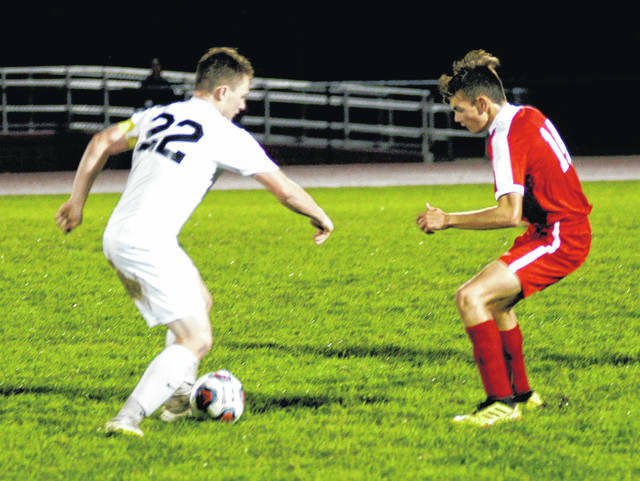 The Indians got off to a rough start as they spotted Miami Trace a goal less than a minute into the match as they netted an own goal to give the Panthers a 1-0 lead. The remainder of the fist half was scoreless as both teams struggled to gain traction on the muddy field and the game went to halftime with the scoreboard reading 1-0 in favor of the Panthers. The second half was a hotly contested defensive struggle that saw both teams unable to convert when they got the ball in the box. Quinn Conlon finally ended the Indians scoreless night with 11:36 to play as he netted a goal on a free kick to tie the match at 1-1. The Panthers retook the lead with just over five minutes to play as Sebastian Gurruchaga sent one past the Hillsboro keeper to reestablish the lead for Miami Trace at 2-1. Conlon came to the rescue again with 1:17 to play as he crashed the box on a free kick by Hunter Hice and sent the ball screaming over the head of the Panthers goalie to tie the game at two where it would not change as the match ended in a draw. Hillsboro has a matchup on Tuesday with FAC leading Chillicothe on the road and the Panthers will travel to Jackson to take on the Ironmen in another FAC match. https://www.timesgazette.com/wp-content/uploads/sites/33/2018/09/web1_Hillsboro-Boys-Soccer.jpgMiami Trace’s Drew Batson attempts to make a move against Hillsboro’s Ethan Snapp on Thursday at Hillsboro High School where the Indians battled the Panthers in an FAC match.